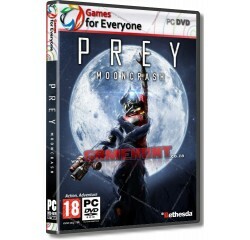 PREY - Mooncrash (Stand-alone) - R160,00 : Game Hunt, Where we lead, others follow. Fight overwhelming odds to escape a secret TranStar moon base where the enemies you encounter, the hazards you face, the goals you complete, and the loot you collect are different each time you play. With changing environments as dangerous as they are dynamic, the Mooncrash campaign for Prey will offer a fun, infinitely replayable challenge to test even the most skilled players. Live. Die. Adapt. Escape! - Escape TranStar's moon base before the Typhon threat takes over. A simple goal, but one with hundreds of viable solutions. In Mooncrash, players will experience an all-new, infinitely replayable, 'rogue-lite' campaign with ever-changing enemies, weapons and objectives against a constantly increasing alien threat. Survive How You Want with Who You Want - Unlock multiple characters as you play, each with their own set of specialized, upgradable skills. Will you forge your path with the resourceful engineer Joan, trade that wrench in for Security Officer Bhatia and his shotgun, or will you choose the frail-but-gifted Andrius and his arsenal of psychic abilities? Prey is about choices, and those choices belong to you. Search for Secrets, Loot...and a Way Off - Arkane Studios' talent for detail and story-rich environments comes alive in Mooncrash. As you explore the station, which is the same size and scope of four levels of the original game's Talos I station, don't forget to keep your eyes peeled for precious supplies - and, of course, Mimics. New Challenges, New Solutions - The Typhon threat has returned with familiar foes and tough new enemies, each armed with a unique set of deadly characteristics. Use the full power of the arsenal at your disposal, including popular weapons and abilities from Prey's main game, to fight for your life and make a mad dash for your escape. Prey: Typhon Hunter - Mooncrash also includes the upcoming Typhon Hunter multiplayer update, a tense game of hide and seek between a single survivor and five other players who stalk, hunt, and hide in plain sight as mimics. Typhon Hunter update is expected to release later this summer on all platforms. Processor - Intel i5-2400 or AMD FX-8320® or equivalent AMD® processor.